Suleikha Snyder : BOLLYWOOD AND THE BEAST is here! BOLLYWOOD AND THE BEAST is here! At last, it's Bollywood and the Beast release day! Hurrah! This is really a book of my heart, one that I hope speaks to a wide audience. Check out what Heroes and Heartbreakers and RT Book Reviews had to say about the story! It’s not just the roses that have thorns. truth hits home when her outspoken nature lands her in hot water with the media. 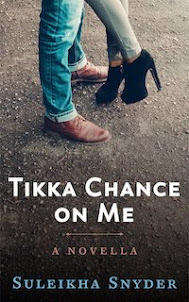 Banished to her leading man’s crumbling mansion on the outskirts of Delhi until things cool down, she is wholly unprepared to meet her costar’s reclusive brother, Taj Ali Khan. Taj, a former action hero until a stunt gone horribly wrong ended his career, wears a cape of scars and a crown of rudeness. As his cynicism collides with her determination to stick it out in Bollywood no matter what, sparks fly. But little do they know that demons not of their making may turn their fiery, fragile connection to ash. And it will take more than sheer grit to face down the most frightening monsters of all—the ones inside themselves. Get it at Samhain at its initial sale price of $3.15 or snag it at Amazon for $3.44.